Blinds are a wonderful invention because they allow you to let light into your home during the day and cover your windows at night with only the turn of a small lever. Most of us probably don’t notice that, over time, dust and dirt can start to pile up on our blinds, leaving them looking dingy. Although we don’t need to clean them very often, it’s a good idea to give them a good cleaning at least twice a year. Learning how to clean dirty blinds is easier than you might think. I think the easiest way to clean blinds is to take them down from the windows so that you can use soap and water to wash them thoroughly. Your other option is to wipe them down as they hang. Before you start cleaning, the first thing you want to do is to check and see if your blinds will come out of the mounting brackets easily. The blinds in my current home won’t come off easily, and I’m afraid to force them because I don’t want to take a chance that they might break. In other homes I’ve lived in, the blinds come down quite easily, so it really just depends on your brand of blind. If you are able to easily take down your blinds, great! If not, don’t worry…there’s a way to clean yours too (see below). Once you’ve got your blinds down, put them into the bathtub with some warm water and a gentle dish soap. I like to use Mrs. Meyer’s Dish Soap from Grove Collaborative (affiliate link) to clean my blinds because it is gentle and won’t harm the blinds. Use a soft cloth (microfiber is great) and wash the blinds like you would dishes, until all the dust and dirt have been removed. Then make sure to dry them thoroughly with a soft towel, or hang them up to drip dry in the shower. Alternatively, you can take them into your backyard, lay them out flat on your patio or deck, so that you can spray them with a garden hose. Then use your dish soap and soft cloth to wash the blinds, making sure to rinse well. If your blinds won’t come down easily from the wall, or if you just don’t want to bother taking them down, you’ll have to give them a good cleaning where they hang. Obviously, you can’t use the soap and water method here, otherwise you could have a bigger mess on your hands 🙂 In this case, it’s best to use a duster. My favorite thing to use on my blinds is this type of small microfiber duster (affiliate link). It’s very handy for brushing off the dust from in between each individual blind, and the microfiber is great for holding on to the dust so that it doesn’t just fall onto another blind below. When I worked as an office manager back before I became a mom, I remember the janitorial company coming in to do a deep clean one day, and I watched them use one of these dusters to clean the blinds. So you know if professional cleaning companies are using these to clean with, you’ve got a great tool! Alternatively, you can try this microfiber blind cleaning brush (affiliate link) for dusting your blinds. I actually found one at the dollar store, so you might want to check your local store and see if you can get one there to save a bit of money. I liked that this brush had a cover that was washable, and fits completely around each blind, however, as you can see, it only cleans two blinds at a time, making it a bit time consuming to clean a house full of dirty blinds. I felt like the job went faster with the general duster. No matter what tool you use, you want to go along each section of the blinds, brushing the dust off as you go. If your blinds have any food or drink splatter on them…which can be common if you have blinds near your kitchen table and a couple of toddlers…you may have to get a damp, soapy cloth to really get them clean. 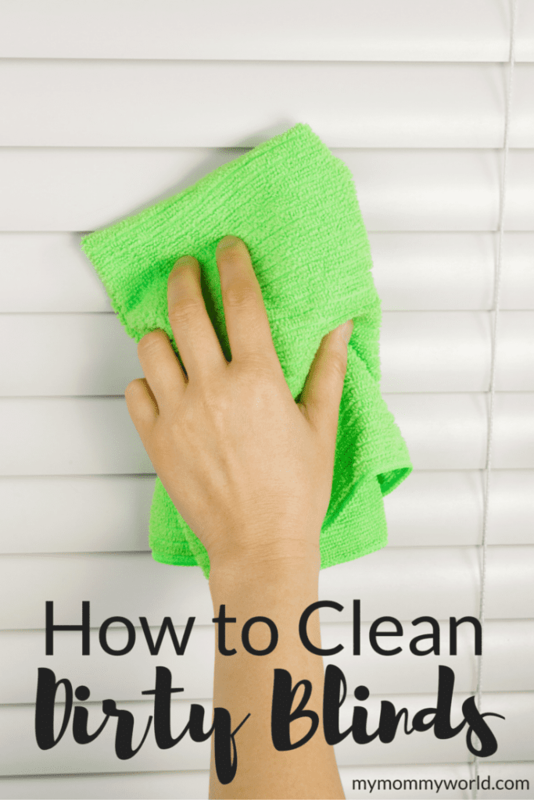 No matter which method you use, learning how to clean dirty blinds is a worthwhile task. Luckily, it only has to be done occasionally, and it makes your home look so much nicer. I usually take my blinds down and outside to hose them off and then scrub them with soapy water. At our old home, I used to wash them in the tub but our window blinds at this house are just too wide to fit in the tub. I try to take them down about once a year and then once a year I use my microfiber cloth to clean them, as well as vacuuming them each month. I’m always surprised at how dirty they can become. I will have to try some of these tips. I’ve used wipes to clean and its just a pain to clean.